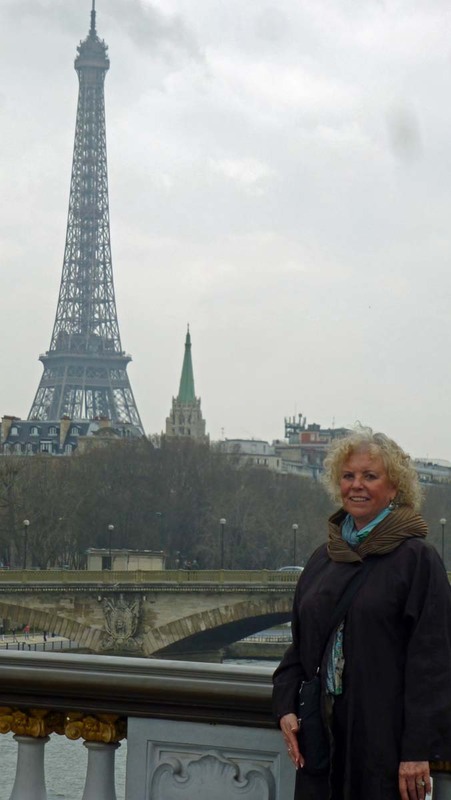 We’re just leaving France now after our winter of hibernating and goatkeeping in the country. It was an excellent beading retreat: comfy couch, bright light, and best of all, bad weather. My goal for these three months was to learn new stitches and try to fashion glass seed beads into something that looked like fine jewelry. Hence, I only brought silver, gold, pearl and crystal beads, though I couldn’t resist buying a few pastels after I got here. 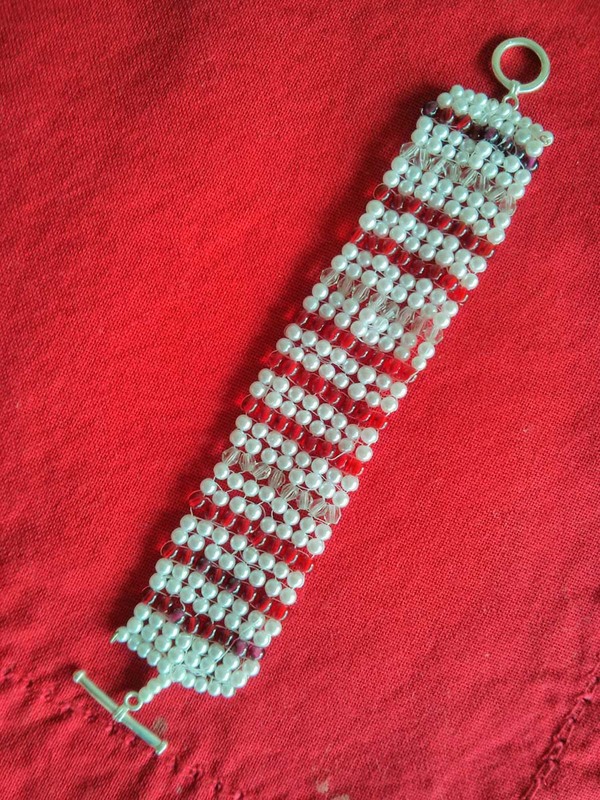 First I learned herringbone and made a fine pearl and garnet cuff. It’s a bit rough and asymmetrical, and if you do herringbone with round beads, the pattern is lost. I like it anyway. 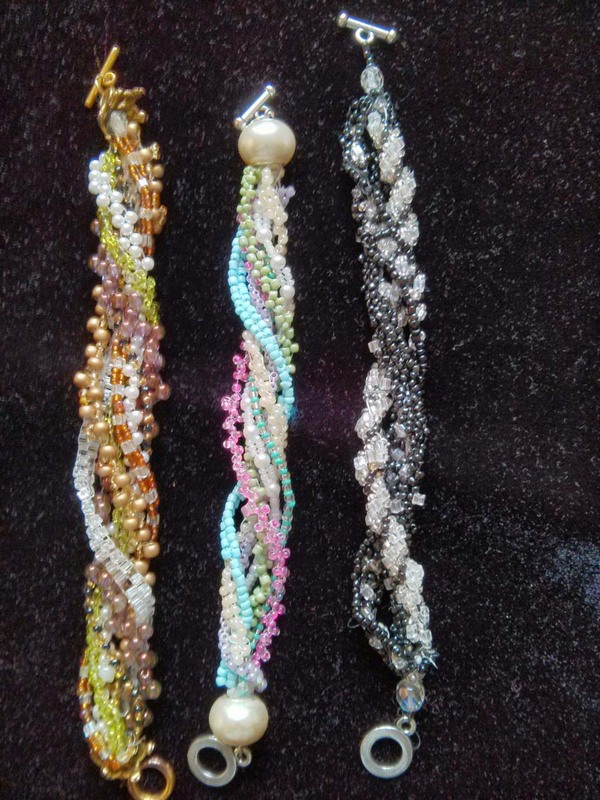 My favorite was the sampler bracelet from Carole Rodgers’ The Beaded Bracelet, which I had downloaded to my Kindle. (Can’t travel with big beading books!) This bracelet is made of six strands, each in a different color and a different stitch, and I love the way they look. I made a Winter Bronze, an Easter Egg pastel, and a Starry Night. (Ran out of black beads with that one.) The pattern calls for cones at the ends, which I didn’t have, but the new big-hole fake Pandora beads was a great way to hide the thread ends. 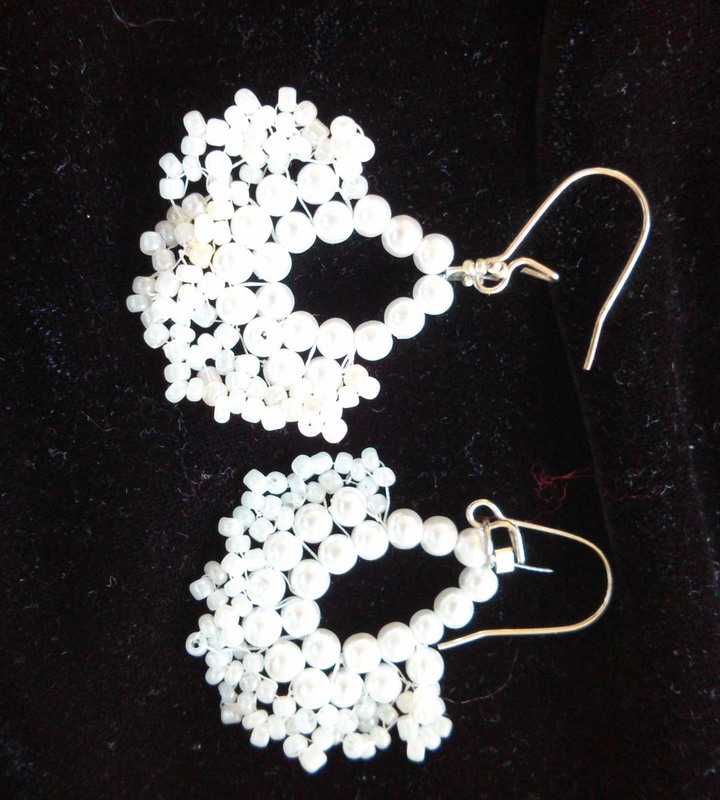 I went wacky for white at the Tout a Loisirs store in Paris, (Rue des Archives, if you’re in the Marais) and bought white Indian beads with tiny mirrors. I actually dreamed a design for them (yes! In my sleep! 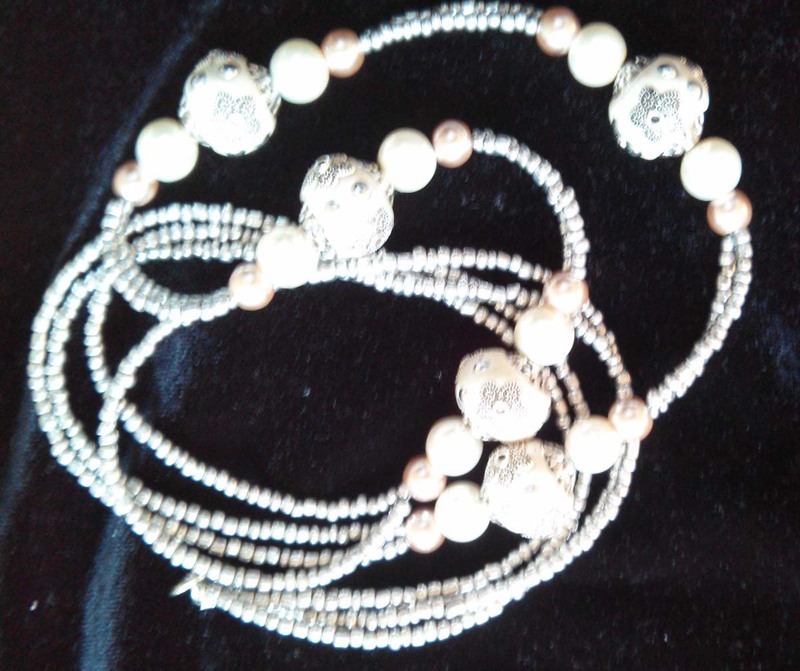 ), and made the necklace the next day. I’d like to make it more complicated, which I might do. As the rain droned on, I downloaded a few more beading books and made the Marigold Fan earrings from Mastering Beadwork by Carole Huber Cypher. These copy an ancient design I’ve always been fond of. It was a challenge to lash beads to threads, and the threads are not invisible, but I’ll keep working on it. I also played with spiral and tubular peyote, and tore a lot of experiments apart to start over (this is required to do any learning!). I did save my dreadful attempt at a tiny peyote French flag, with its panels of red, white, and blue. Imagine how hard it would be make a perfect rectangle using seed beads which are all officially size 11, but vary in size anyway. These are good practice beads or texture beads, and I feel ready to move on to the pricier Japanese beads that are guaranteed uniform. By the way, after I gave up on the peyote French flag, I found another way to suggest the flag by simply stacking the colors on a head pin. 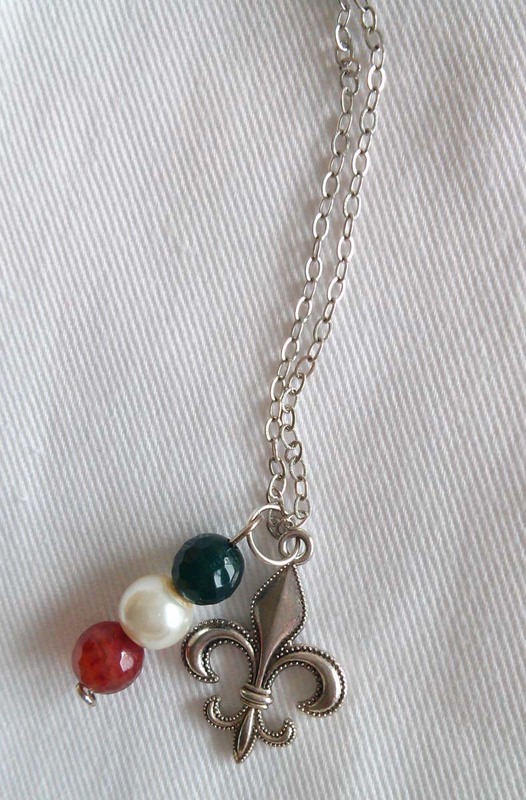 Hung on a chain along with a fleur de lis charm, it was a great gift for a new friend in France. Okay, I’m almost home in Portland, the land of splendid bead shops, classes galore, art shows and festivals, and a beading community. Also I have beads of all sizes and colors waiting in my stash. New design adventures await!